Looking for a super easy, super fun Thanksgiving craft? Have kids of different ages and can’t find something that can keep all occupied? Well, you are in luck! 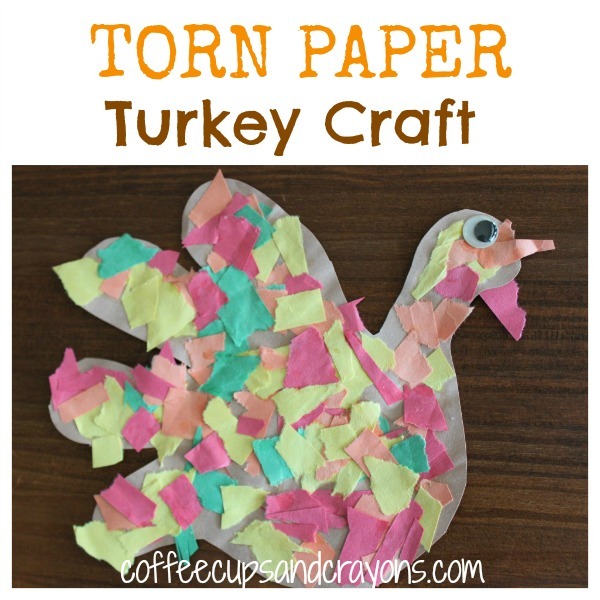 One of my kids’ favorite Thanksgiving crafts–torn paper turkeys–may just be what you’re looking for. Scraps of paper in whatever color you want. Scissors–unless you are really, really good at tearing out turkey shapes! Your favorite glue–stick, school, whatever works best with your kids. Cut or have your child cut out a turkey shape. Let the kiddos go to town tearing up the paper into tiny pieces. Have them glue the paper pieces onto the turkey shape. We had lots of little leftover scraps from our Thankfulness Tree that were able to use to make a bunch of torn paper turkeys. So plan ahead if you are making a bunch of projects this week and save the scraps for this cute craft! I love this and will pin it on my Recycle! Kid’s Activities and Art board. Love your blog and happy to find it. Thanks Susan! We love simple crafts and upcycling! Thanks for stopping by! Very fun! I bet my kiddos would love this. And I JUST opened a new bag of googly eyes — perfect timing! Thanks so much! Googly eyes are my almost 3 year old’s absolute favorite art material! She love stick them all over paper and then draw around them! Oh that turkey is adorable! And it looks like it would be a lot of fun to do. Thanks so much for posting. Thanks so much Joyce! We definitely love torn paper art in our house! Of course! I emailed you too. Thanks so much!!! If you trace their hands to use as the turkey shape (or even your own if you want it bigger), you won’t have to worry about being able to make a turkey shape!